Palau, an Island Nation in the Pacific Ocean located 500 miles east of Philippines and 2,000 miles south of Japan has a total land area of 177 square miles and a population of around 20,000. The most populated island is Koror. The economy is held up by tourism, subsistence agriculture, and fishing. 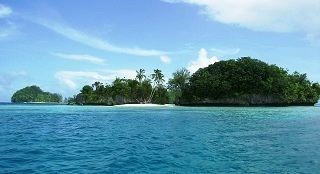 Palau has tropical climate all year round. While the country can claim natural beauty for the most part, it is not without problems. Rising sea level, inadequate solid waste disposal program, fishing using dynamite, and above all, being at the mercy of nature’s fury are all issues the country is trying to tame. January through March is considered the best time to visit Palau but it is not to say it is free of downpour then. Rock Island (mushroom shaped islands) is scenic beauty at its best. Its diverse and pristine marine environment makes it a prime destination for snorkeling and scuba diivng. Crocodiles are also residents of Palau and some can be really huge. Micronesia and Palau 978-0982261934 $18 A forty page introduction followed by sections on Kosrae, Pohnpei, Chuuk, Yap, and Palau. Palau section is about 40 pages. Franko’s Guide Map to the Republic of Palau 978-1601901996 $9 Waterproof guide map, ideal for scuba divers and snorkelers. The first stamps of Palau were a set of four stamps released on March 10, 1983 in the Inauguration of the Postal Service theme. The set (Scott #1 to #4) catalogs for around $2 MNH or used. Palau was part of the US Trust Territory of the Pacific since its establishment in 1947. Palau started issuing their own stamps in 1983 with the USPS continuing to carry the mail to and from the islands. On January 10, 1986, Palau became a Federation as a Sovereign State in Free Association with the United States. A number of sets primarily in the Birds and Marine themes were issued in the interim. Chief among them was a set of thirteen stamps released between 1983 and 1984 in the Marine Fauna theme. The set (Scott #9 to #21) catalogs for around $20 MNH or used. The designs show sea fan, map cowrie, jellyfish, hawksbill turtle, giant clam, parrotfish, chambered nautilus, dappled sea cucumber, sea urchin, starfish, squid, dugong, and pnk sponge. Palau gained independence from UN Trust Territory status on October 1, 1994. A sheet of forty stamps released on May 22, 1986 in the World of Sea and Reef theme. The set (Scott #103a-an) catalogs for around $40 MNH or used. The designs show spear fisherman, native raft, sailing canoes, Rock Islands sailfish, Inter-island boat and flying fish, bonefish, common jack, mackerel, sailfish, barracuda, triggerfish, dolphinfish, spear fisherman, grouper, manta ray, marlin, parrotfish, wrasse, red snapper, herring, dugong, surgeonfish, leopard ray, hawksbill turtle, needlefish, tuna, octopus, clownfish, squid, grouper, moorish idol, Queen Conch starfish, squirrelfish, starfish and sting ray, lion fish, angel fish, butterfly fish, spiny lobster, mangrove crab, tridacna, and moray eel. The set is considered the most recognized stamps of Palau and is very collectible. Palau is actively engaged in regional environmental initiatives and was the world’s first to create a shark sanctuary covering 230,000 square miles of its waters. A long set of eighteen stamps released between 1991 and 1992 in the Birds theme. The set (Scott #266 to #283) catalogs for around $35 MNH or used. The designs show Palau bush-warbler, common moor-hen, banded rail, Palau fantail, mangrove flycatcher, purple swamphen, Palau fruit dove, great crested tern, Pacific reef heron, Micronesian pigeon, great frigatebird, little pied cormorant, jungle night jar, cattle egret, great sulphur-crested cockatoo, blue-faced parrot, eclectus parrot, and Palau bush warbler. A series of two sets and a souvenir sheet released on October 18, 1995 to commemorate the 50th anniversary of the End of World War II. The sets feature paintings by Wm. F. Draper and Tom Lea and the souvenir sheet features portraits by Admiral Chester W. Nimitz. The sets (Sheet of 12 - Scott #379a-l, Sheet of 5 - #380a-e, and #381) catalog for around $20 MNH or used. The paintings feature Preparing Tin-Fish, Hellcats Take-off into Palau’s Rising Sun, Dauntless Dive Bombers over Malakai Harbor, Planes Return from Palau, Communion Before Battle, The Landing, First Task Ashore, Fire Fighters Save Flak-torn Pilot, Young Marine Headed for Peleliu, Last Rites, and The Thousand-Yard Stare. The portraits feature Admiral Chester W. Nimitz, Admiral William F. Halsey, Admiral Raymond A. Spruance, Vice Admiral Marc A. Mitscher, and General Holland M. Smith, USMC. During World War II, the islands were taken over by the United States in 1944 following the Battle of Peleliu in which more 2,000 Americans and 10,000 Japanese were killed. A sheet of six stamps and a souvenir sheet of two released in 2000 in the Atlantic Ocean Fish theme. The set (Scott #589a-f and #590 to #591) catalogs for around $10 MNH or used. The designs show reef bass, white shark, sharptail eel, sailfish, Southern stingray, ocean triggerfish, short bigeye, and Gafftopsail catfish. Palau uses the US dollar as its currency. They have however issued a number of Republic Collector Coinage Commemorative Proofs over the years starting with the Year of Marine Life Protection issue of 1992. Gold and Silver proofs with low mintage have also been issued over the years. Money beads, storyboards, and handicrafts are the typical souvenirs of Palau. Miscellaneous Collectibles $2 and up Postcards and Flags start around $2. Ounce of Luck Four Leaf Clover Curios start around $30.